Whilst a beautiful pool can be an excellent addition to any home, the key to creating a jaw dropping feature is with stunning pool landscaping designs. At Coral Pools, our talented team aren’t just experts in swimming pool construction, but in designing and creating custom landscapes to complement your pool area and home. With the right plants and pavers, in carefully chosen colours, materials and textures, we can ensure your pool is the perfect addition to your house and blends cohesively across your entire property. What does pool landscaping involve? Trees, shrubs and flowers are a must for any pool area, no matter how big or small. Whether you’re looking for a single potted mandarin tree or a fully landscaped garden featuring hedging for privacy and plants running the length of your pool, our team has the skills and knowledge to create something beautiful. We can help you choose the right paving and coping to suit both your homes architectural style and your natural environment too, creating a cohesive look across your whole property. 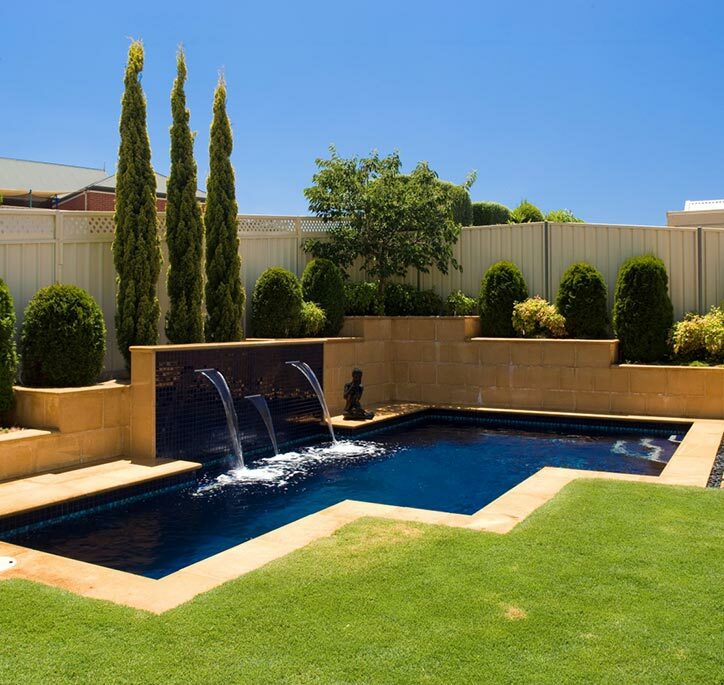 Whether you want paving or decking surrounding your pool; tiling or exposed aggregate concrete for your coping; a classic tubular fence or modern glass fencing custom built for your pool area, we have the skills and experience – not to mention eye for detail – to make your whole property look its best. Will my pool need landscaping? Not all pool owners choose to invest in landscaping services – at the end of the day, it’s completely up to you. However, the pool installation process may damage the surrounding area. Landscaping will rebuild and transform the area into something beautiful. For best results, we recommend choosing a theme and sticking to it across your entire property – for example, we can create a tropical oasis with lush greenery, a native bushland with wattles and kangaroo paws, or a traditional English garden with beautiful box hedges. Which pavers should I choose? The pool paving and coping you choose will also play a large role, as will the fencing, decking, and any other materials used in the pool area. Choose materials and colours that are already in use across your home and property for a cohesive look. Which materials are right for me? Which pavers should I choose?The pool paving and coping you choose will also play a large role, as will the fencing, decking, and any other materials used in the pool area. Choose materials and colours that are already in use across your home and property for a cohesive look.Which materials are right for me?If you already have an al fresco entertaining area, using the same pavers or timber for your pool decking; use fencing that’s already in use in your front yard or balcony; and ensure your pool coping complements the materials you’ve used for the deck or pavers. Based in Ravenhall, Coral Pools is proud to offer its professional pool building services to the western Melbourne region, including Deer Park, Derrimut, Laverton, Sunshine, Caroline Springs, Altona, Rockbank, Tarneit, Hoppers Crossing, Williamstown, Werribee, Point Cook and many more. Please contact us to see if we offer landscaping, including pool fencing and coping,in your area.